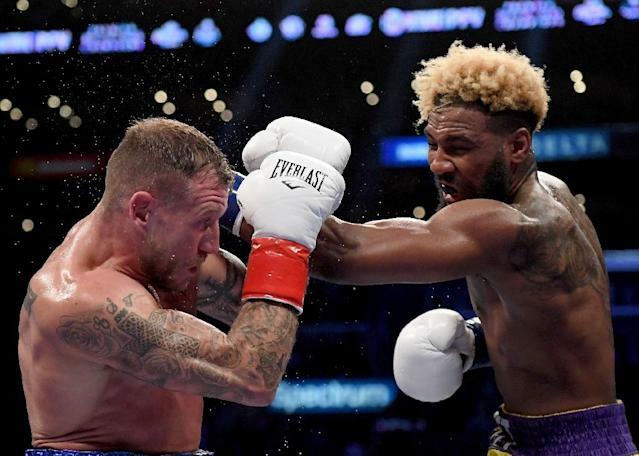 Washington (AFP) - Undefeated Jarrett Hurd will defend his world super welterweight titles against fellow American Julian Williams on May 11 in suburban Washington, promoters announced Thursday. Hurd, hoping to become an undisputed champion, owns the International Boxing Federation and World Boxing Association titles and stopped current World Boxing Council champion Tony Harrison in the ninth round in a 2017 fight. Hurd, 23-0 with 16 knockouts, stopped compatriot Tony Harrison in 2017 for the IBF crown and defends it for the fourth time. He took the WBA belt from US southpaw Erislandy Lara by split decision last year and defended both last December by knocking out Britain's Jason Welborn. Williams, 26-1-1, fights his fellow 28-year-old in hopes of stretching his win streak to five bouts since his lone loss, which came in his only prior world title bout, a knockout loss to Jermall Charlo in December 2016. The bout will be staged in Fairfax, Virginia, near Hurd's hometown fans. "I couldn't be happier to be fighting at home for the first time as a champion," Hurd said. "Julian Williams is a tough opponent and I don't see him as a stepping stone. He's crafty, technical and fundamentally sound. "I want to go out and get a decisive win and show that I'm on a different level than everybody else in the division." Williams can realize his career dream of a world title with a triumph. "I'm looking forward to putting on an exciting fight," Williams said. "And most importantly winning those titles and showing the world that I'm the best in the 154-pound division."